Awe-inspiring and other worldly, millions of tourists have traveled to Iceland for a chance to see the Northern Lights. Watching this celestial light show can help human beings feel a sense of connection with the outer solar system and the power of our sun. However, like most things in nature, the Northern Lights are also elusive and dependent on many different weather conditions. After researching the science and optimal weather patterns for the Northern Lights, we traveled to Iceland in mid-December hoping to view the phenomenon for ourselves. 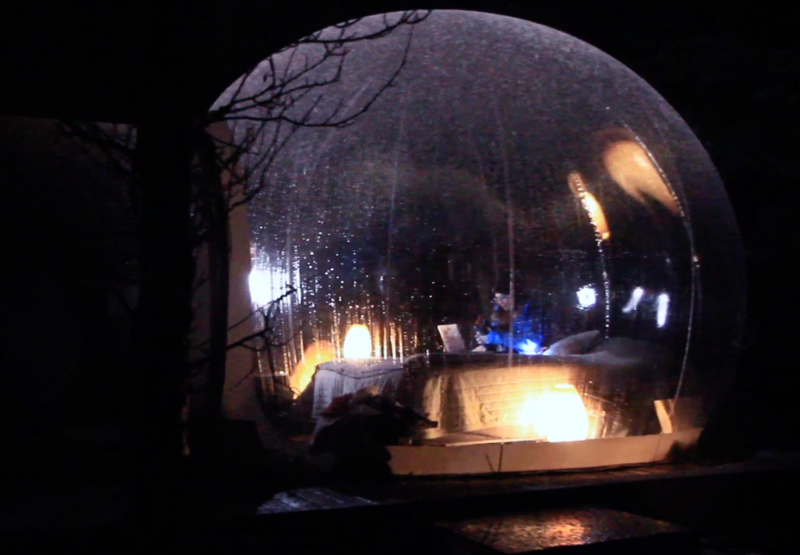 Since we were serious about our hunt and did not want to miss a moment of the night sky, we decided to spend a night at the Bubble Hotel, also known as the Five Million Star Hotel. This unique Igloo-like enclosure constructed of see-through plastic, provides a panoramic view of the night sky, and helped fulfill our childhood dream of sleeping under the stars. The Northern Lights are caused by interplay between particles from the sun entering into the earth’s atmosphere. The sun is like a mega-sized power plant with temperatures reaching over 25 million degrees. It generates so much heat and pressure that the dominant gas, hydrogen, is literally squeezed and smashed. When placed under such extreme conditions, hydrogen fuses into helium through a process known as nuclear fusion. Elements under this type of immense pressure transform into a fourth state of matter, known as plasma. With its extreme volatility, solar storms often occur on the sun, which sends plasma and other particles hurling out toward the earth. The earth is constantly bombarded by these solar storms, but has a protective shield. The center of the earth contains a core of hot, molten iron under tremendous gravitation pressure. This core generates a magnetic field, known as the magnetosphere, that extends out through the crust and into the atmosphere. When the plasma and particles from the sun try to enter the earth’s atmosphere, known as a “solar wind,” the magnetosphere provides a protective barrier, so that the particles bounce off back into space. However, there are areas of the magnetosphere that are weaker, at the northern and southern poles, and it is at these locations that the sun’s particles can manage to get through. When these particles arrive in the earth’s atmosphere, they are met by two atmospheric gases, oxygen and nitrogen. Mixing with these gases increases their energy levels and excites them. To calm down, they must release energy and do so in the form of photons, which are tiny packets of light. 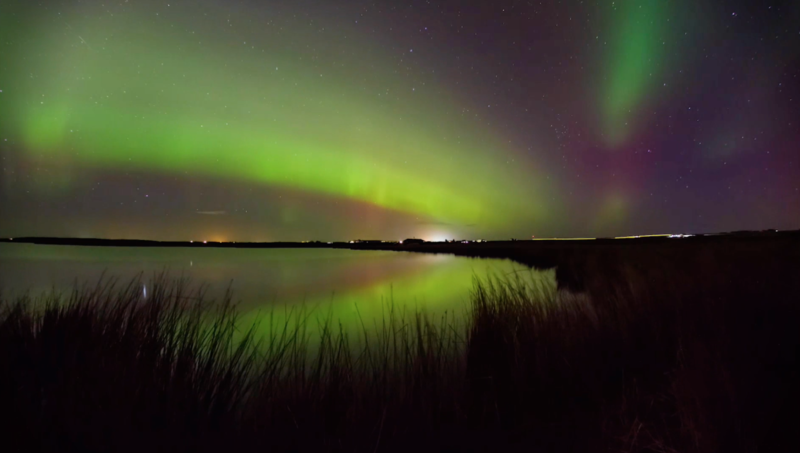 Depending on where the photons are released into the atmosphere they produce different colored auroras from blue and green at lower altitudes to shades of red at higher levels. Because the collision of particles and gases is an active event, the Northern Lights often move and “dance” across the night sky. Auroras tend to be active for two to three nights then low for four to five nights in ongoing cycles. Many experts recommend staying in Iceland for a least a week for the best chance of a sighting. They are best seen in total darkness, because they will be out-shined by any sunlight. In Iceland the ideal months range from September to mid-April. We traveled to Iceland in December, when daylight is extremely short. The sun rose around 11 AM and set at 4 PM, while in August the days are extremely long with sunrise is at 3 AM and sun set at 12 AM. The ideal weather conditions for viewing the auroras are on cold, crisp nights with clear skies and very little precipitation. For pre-planning, there is a meteorological website available, Icelandic Northern Lights Forecast, en.verdure.is/weather/forecasts/aurora, which provides a detailed forecast of the cloud cover and the predicted aurora activity rated on a scale from 0-10. For our night at the Bubble Hotel, we drove to a remote area in the south-western part of Iceland. The owners keep the location a secret, so we received the latitude and longitude coordinates, only after we booked. The Bubbles are nestled in an area of farmland with a clear skyline. When we arrived we were greeted by the caretaker and shown to our Bubble. Each bubble is hidden amongst the trees and very private. It contains a comfortable bed, lamps and a small space heater. On site there is also a common room with a small kitchen, restrooms and showers. Each Bubble has a noiseless ventilation system, which constantly pumps air into the bubble to keep it heated and also inflated. Though it was a chilly-mid December night, we felt very warm and comfortable inside. We had been staying on the outskirts of the city at a Farmhotel, and joked that the Bubble was actually cozier than our cabin room. The magical view happens at night when you turn off the lights. The plastic walls of the Bubble disappear, so you have a panorama of the sky and truly feel as though you are sleeping out under the stars. During our time in the Bubble, we relied on flashlights and mobile gear to capture the experience. To maintain optimal functioning even off the grid, a technical key for us was using Energizer Ultimate Lithium AA Batteries. I partner with Energizer because their batteries are the longest lasting on the market, leak resistant and can handle extreme weather conditions ranging from -40 to 140 degrees. The experience reinforced how important it is to pack the highest quality gear when traveling to such extreme locations. A common saying in Iceland is, “If you don’t like the weather wait five minutes and it will change.” This was true throughout our trip and particularly during our night at the Bubble. The evening began with a wintry mix of precipitation early in the evening, but by midnight, the clouds began to recede, and the sky cleared. We checked the Aurora Forecast, which was low at two, but we were still hopeful. We stayed awake most of the night hoping to see the Northern Lights, but even though we had ideal conditions with clear skies, we unfortunately did not see them. This was disappointing, but did not really dampen our spirits, because the experience was still completely magical. Being city dwellers, we never have full view of the night sky, so sleeping underneath the constellations and shooting stars was an experience that we will never forget. Katie Linendoll is a technology expert and is a regular on-air correspondent to AMHQ on The Weather Channel. Follow her on Facebook, Twitter and Instagram and check out her website, www.katielinendoll.com!